Meridian answers your questions about nonqualified deferred compensation. A nonqualified deferred compensation plan represents an unsecured promise by an employer to pay compensation to an employee at a future date. Such a plan is not subject to the complex rules under ERISA that are applicable to tax-qualified retirement plans (regarding eligibility, nondiscrimination, funding, trust requirements, etc.). This gives employers significant flexibility in designing nonqualified deferred compensation plans to meet specific objectives. 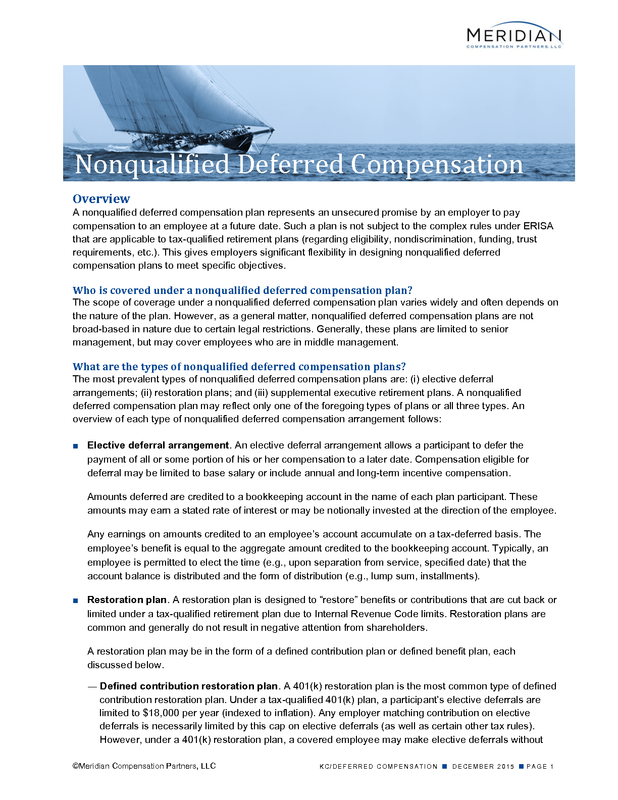 Who is covered under a nonqualified deferred compensation plan? The scope of coverage under a nonqualified deferred compensation plan varies widely and often depends on the nature of the plan. However, as a general matter, nonqualified deferred compensation plans are not broad-based in nature due to certain legal restrictions. Generally, these plans are limited to senior management, but may cover employees who are in middle management. What are the types of nonqualified deferred compensation plans? Elective deferral arrangement. An elective deferral arrangement allows a participant to defer the payment of all or some portion of his or her compensation to a later date. Compensation eligible for deferral may be limited to base salary or include annual and long-term incentive compensation. Amounts deferred are credited to a bookkeeping account in the name of each plan participant. These amounts may earn a stated rate of interest or may be notionally invested at the direction of the employee. Any earnings on amounts credited to an employee’s account accumulate on a tax-deferred basis. The employee’s benefit is equal to the aggregate amount credited to the bookkeeping account. Typically, an employee is permitted to elect the time (e.g., upon separation from service, specified date) that the account balance is distributed and the form of distribution (e.g., lump sum, installments). Restoration plan. A restoration plan is designed to “restore” benefits or contributions that are cut back or limited under a tax-qualified retirement plan due to Internal Revenue Code limits. Restoration plans are common and generally do not result in negative attention from shareholders. A restoration plan may be in the form of a defined contribution plan or defined benefit plan, each discussed below. Defined contribution restoration plan. A 401(k) restoration plan is the most common type of defined contribution restoration plan. Under a tax-qualified 401(k) plan, a participant’s elective deferrals are limited to $18,000 per year (indexed to inflation). Any employer matching contribution on elective deferrals is necessarily limited by this cap on elective deferrals (as well as certain other tax rules). However, under a 401(k) restoration plan, a covered employee may make elective deferrals without regard to the $18,000 cap. Similarly, an employer may make a matching contribution on these uncapped elective deferrals. A tax-qualified defined contribution plan may also provide that each participant receive a discretionary contribution (sometimes referred to as a profit sharing contribution). Typically, this contribution is expressed as a percentage of a participant’s “covered compensation” (i.e., 10% of covered compensation). Tax rules limit covered compensation to $265,000 for 2016 (indexed to inflation). Under a defined contribution restoration plan, discretionary or profit sharing contributions may be made with respect to compensation that exceeds $265,000. All contributions made under a defined contribution restoration account are credited to a bookkeeping account established in the name of each plan participant. As with elective deferral arrangements, account balances under a defined contribution restoration plan either earn a stated rate of interest or are notionally invested at the direction of the employee. Typically, an employee is permitted to elect the time (e.g., upon separation from service, specified date) that his account balance is distributed and the form of distribution (e.g., lump sum, installments). Defined benefit restoration plan. A defined benefit restoration plan is intended to “restore” benefits lost to an employee under a tax-qualified defined benefit plan (e.g., pension plan) due to Internal Revenue Code limits (e.g., limits on covered compensation, maximum benefit). Typically, a defined benefit restoration plan does not require or permit employee contributions. Benefit payments generally commence upon a specified retirement date. Supplemental executive retirement plan (SERP). Typically, a SERP is in the form of a defined benefit plan under which benefits are based on a pension formula. Unlike restoration plans, SERPs are not designed merely to replace lost benefits, but to provide more generous benefits to covered executives. These benefits are generally paid or commence at retirement. Due in large part to the negative views of SERPs held by many institutional shareholders and their advisors, the prevalence of SERPs has declined significantly over the last ten years. What is the tax treatment of nonqualified deferred compensation? Generally, amounts accrued under or contributed to a nonqualified deferred compensation are not subject to federal income tax until paid to the employee (including any earnings thereon). They are subject to federal payroll tax at the time of vesting however (though see discussion below regarding impact of plan funding and Section 409A on the timing of taxation). An employer may take a corporate deduction for deferred compensation at the time and in the amount the employee includes the deferred compensation in taxable income. How is a nonqualified deferred compensation plan funded? Generally, deferred compensation plans are “funded” through corporate assets, insurance products or both. Often, companies will hedge their liability under a deferred compensation plan by setting aside corporate assets equal to amounts contributed under the plan and investing those assets to reflect participant investment elections. Other companies take a pay-as-you-go approach and do not set aside any assets to cover future payments of deferred compensation. However, to receive the favorable tax treatment discussed above, a nonqualified deferred compensation plan must remain unsecured for tax purposes. This requires that any corporate assets that are set aside to “fund” deferred compensation payments remain subject to the reach of the company’s general creditors. This means a participant’s interest in his nonqualified deferred compensation benefit is equivalent to that of a general unsecured creditor. In the event of a company’s bankruptcy or insolvency, the participant could lose all or some portion of his benefits under the company’s nonqualified deferred compensation plan. If deferred compensation is funded and secured (i.e., corporate assets are set aside to fund deferred compensation and these assets are beyond the reach of creditors), then the deferred compensation is includible in gross income of the employee and subject to federal income tax in the year of vesting. How are Rabbi Trusts used to fund nonqualified deferred compensation? Rabbi trusts are used by companies to “fund” nonqualified deferred compensation plans. Companies will make cash contributions to such a trust to fund their future obligation to pay deferred compensation benefits. Rarely are such contributions mandated. Amounts may be invested by the trustee in accordance with participant investment direction. A rabbi trust is intended to provide a degree of security that accumulated deferred compensation benefits will actually be paid. Amounts contributed to an irrevocable rabbi trust may not revert to the employer until all nonqualified deferred compensation benefits have been paid to eligible participants. This feature protects participants against the employer reneging on its promise to pay deferred compensation benefits, which is often considered especially important in the context of a hostile change in control. Nonqualified deferred compensation plans frequently provide that upon a change in control, the employer will fully fund its deferred compensation obligations through a rabbi trust. The assets of a rabbi trust are subject to the claims of creditors. If the employer establishing the trust becomes insolvent or bankrupt, the assets of the trust are available to satisfy claims of general creditors. Therefore, deferred compensation paid through a rabbi trust will continue to enjoy favorable tax treatment (i.e., will not be subject to federal income tax until paid). How are Secular Trusts used to fund nonqualified deferred compensation? A secular trust fully secures payment of an employee’s deferred compensation benefits. Unlike a rabbi trust, deferred compensation contributed to a secular trust is beyond the reach of the employer (except if forfeited) and its creditors. Amounts contributed to a secular trust may either vest immediately or pursuant to a vesting schedule. The payment of vested benefits generally will occur at a later date such as upon separation from service, retirement or attainment of a specified age. However, taxation of deferred compensation contributed to a secular trust is triggered upon vesting, not payment (the employer may take a corporate deduction at the time of vesting). This tax liability may be satisfied through: (i) the employee’s own funds; (ii) a tax bonus payment from the employer; or (iii) a distribution from the secular trust. Secular trusts are not common. How does Section 409A impact deferred compensation arrangements? Section 409A subjects deferred compensation plans to a complex set of rules. A discussion of these rules is included in the item entitled “TAX 409A-Tax Deferrals”. The penalties for noncompliance with Section 409A are severe. Upon vesting, compensation deferred under a noncompliant plan or arrangement will become subject to regular federal income tax, a 20% excise tax and penalty interest accruing from the date of vesting. All these taxes and interest are payable by the recipient of the deferred compensation, not the employer.